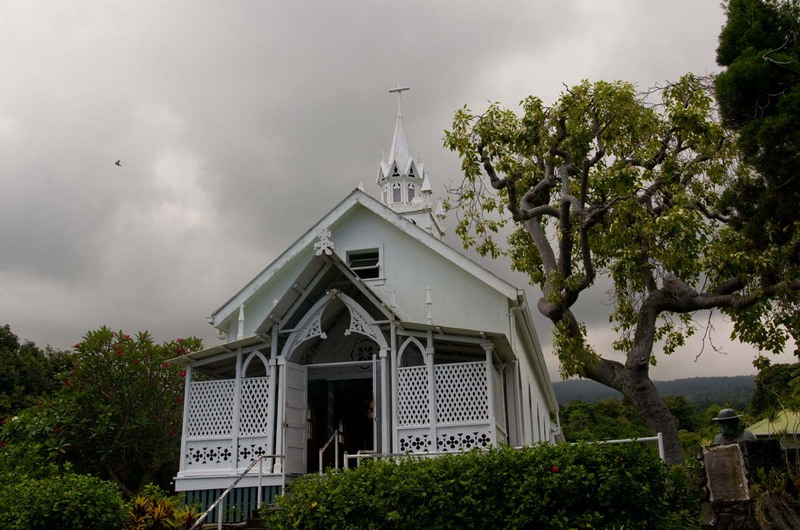 Tucked deep within the jungles of Kona, Hawaii, this simple wooden chapel is hard to find and even easier to overlook. There is nothing about its exterior that commands attention, except maybe for the stunning views of Kealakekua Bay that are seen from just about everywhere in the area. To understand why travelers go out of their way to get here, you have to step inside. Once you do, the reason the officially titled St. Benedict’s is more commonly known as “The Painted Church” becomes clear. Colorful murals, depicting both biblical scenes and architectural elements mimicking grander cathedrals, canvas the interior of this humble church from floor to ceiling. It is said that the self-taught artist and priest John Berchmans painted the murals with ordinary house paint to help teach biblical stories to his illiterate congregation. Translated bibles and Hawaiian newspapers, however, predated Berchman’s arrival on the island by 70-odd years, indicating the paintings were done at least as much for their aesthetics as for their utility. And if beauty was reason enough for him to spend years painting it, it’s more than enough reason for us to go out of our way a bit to see it. I clicked on the picture and it filled my screen with amazing color! Great panorama (or lens). Thanks for sharing. It’s a panorama. I like to travel light and am increasingly trying to do things in post-production that would otherwise require me to lug extra gear – like stitching together wide angle shots instead of carrying a special lens. This one came out nice, I think. This is such a beautiful place, I visited here several years ago. Would love to head back to Hawaii soon! Hawaii is one of those places that always seems to call us back. well, that’s a little treasure, isn’t it? And it’s amazing that it was painted by an untrained artist. Wow, I totally missed that one when living there. Beautiful colors and paintings. Thanks for sharing. It’s easy to miss. We’re lucky to have found it. that I could find,when I happened upon “This Painted Church” I believe?Three questions: 1) Is there a modern building to the left? 2) This church does not have electricity true? 3) Is it overlooking the water kid of on a hill? I stayed until the sun was setting and got the most beautiful pictures of the sunset at each moment it faded but I lost my pictures! So now I want to go back to see what I saw! P.S. My daughter and I walked to the Green Sand beaches that was amazing as well!